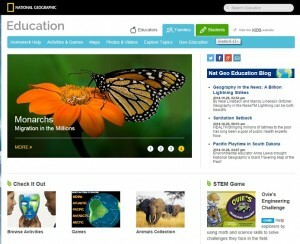 The NG Education website at NatGeoEd.org offers free geography, science, and social studies resources for K-12 educators and students. These highly engaging, multimedia materials maximize learning in and out of the classroom. The site features wide-ranging instructional content—spanning pre-kindergarten through post-secondary—that brings concepts and real-world events to life for our worldwide audience. Cutting-edge multimedia and mapping tools engage a new generation of young people in National Geographic’s iconic research and media. The website is organized according to the audience to which it is addressed. Thus, there is a section for educators, one for families and one for students. In each section there are tabs that bring together the different resources and information. 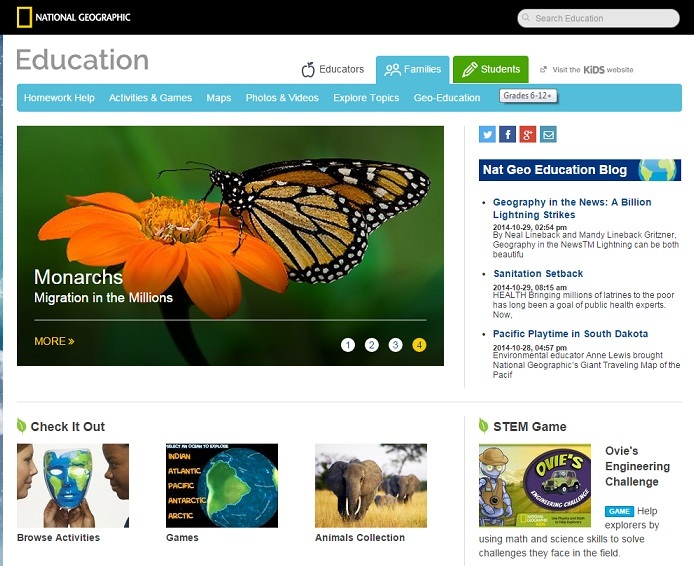 With over one million visitors each month, the award-winning NG Education website is recognized as one of the most innovative sources for educational and reference content.